Conflict in the Middle East and Africa is driving a human tsunami that has sent 500,000 people into Europe this year in the worst migration crisis since World War II. The four-year-old civil war in Syria has been the single biggest driver of the surge: more than 4 million have fled the conflict, according to the U.N. High Commissioner for Refugees (UNHCR). Syrians made up a third of those crossing the Mediterranean in the first six months of 2015, the largest group by country of origin, followed by Afghans and Eritreans. Beyond conflict, there is another contributing factor: water scarcity. A well-documented path can connect water scarcity to food insecurity, social instability and potentially violent conflict. As climate change amplifies scarcity worries, more secure water supplies could help the lives of millions in conflict zones. Drought and water shortages in Syria likely contributed to the unrest that stoked the country’s 2011 civil war. Dwindling water resources and chronic mismanagement forced 1.5 million people, primarily farmers and herders, to lose their livelihoods and leave their land. Those farmers moved to urban areas and magnified Syria’s general destabilization. 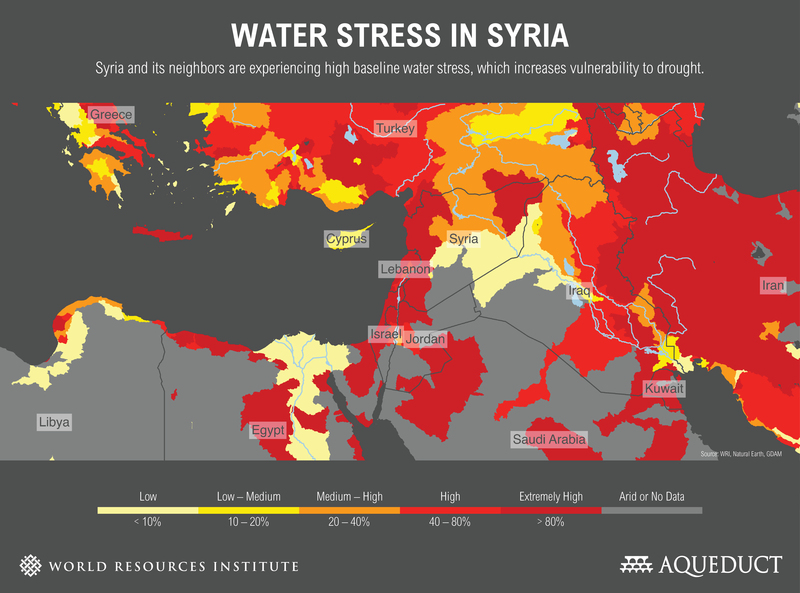 This map from World Resources Institute’s Aqueduct Water Risk Atlas illustrates high water stress across Syria and its neighbors today. These unstable conditions will likely deteriorate in the coming decades. This map projects high water stress across Syria and its neighbors in 2040. Syria is projected to be among the 11 most water-stressed countries in the world by 2040. And it’s far from alone in the region. 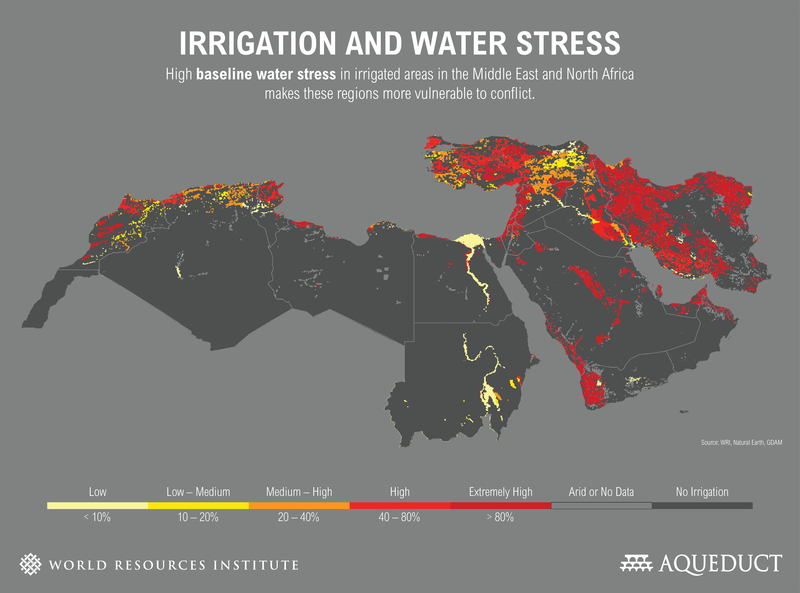 Fourteen of the 33 likely most water-stressed countries in 2040 are in the Middle East. Water stress is an underlying conflict multiplier that will not go away. These maps can reveal where water stress threatens agriculture, as below: irrigated areas are overlaid on one of Aqueduct’s 12 data layers called baseline water stress. Areas in color on this map are irrigated, showing how much competition there is for water in a given area. The darkest-red irrigated areas are the most vulnerable to supply disruptions, where more than 80 percent of available water is withdrawn every year, signaling big implications for food security. We don’t think of the Middle East as a modern breadbasket, but there is irrigated agriculture here at risk. Stress maps like these are critical in identifying potential hot spots for food disruption and conflict. Food prices and other food-supply disruptions are caused by a complex series of factors, including the global food trade and government subsidies. But local water stress can make the situation worse over the long term. Part of the reason Middle Eastern countries had to import so much food is that water is relatively inaccessible compared to other food-growing regions. Tackling a complex challenge like water stress requires the latest data and the tools to use that data. The India Water Tool, for example, is an interactive, online portal with a vast amount of detailed water data for India. Companies, governments, civil society groups, researchers and others can analyze groundwater and surface water quantity and quality, projections for water supply and demand, and more, drawing on Indian government data and global satellite data, all in one easy-to-use website. This is a tool that could potentially be used as a template for other major countries around the world facing water-security issues. Similar global-level tools already exist for different water-related issues, including WRI’s Aqueduct Water Risk Atlas and World Wildlife Fund’s Water Risk Filter. New satellite data and analysis can also provide more accurate and near-real time estimates of water demand and availability for crops. Better data can help provide early warnings of low yields and promote more water-efficient agricultural practices. So what will it take to translate this increasingly detailed, useful information into change on the ground for those who need it most? The most effective solutions are universal: they connect the people most affected by a particular problem from the beginning with the most powerful players in a given area. Many water-related issues – particularly access and availability in rural and urban populated areas – have a more acute effect on the world’s poorest. Any solution will fail without regular participation from those groups. Environmental democracy, inclusive decision-making and access to justice can ensure a more equitable distribution of water and other scarce natural resources. Access to the best available information is a stepping stone toward solving these challenges. EDITOR'S NOTE: An earlier version of this blog was titled "Beyond Violence, Water Stress is a Deeper Cause of Europe's Migration Crisis." We have revised the title, as well as the blog text, to emphasize water scarcity's role as one among many contributing factors to violent conflict.